This week’s Star Trek hype started me thinking. How does a series that we in the Geek community so singularly associate with progressiveness become what it is today? It’s shockingly easy to criticize later iterations of Trek for their failure to live up to the original’s legacy of equality. But maybe we’re coming at this from the wrong direction. Maybe it isn’t about what Star Trek became. Maybe the question should be, ‘what was Star Trek in the first place?’ And to answer that, we need a little context. For starters, what does ‘progressive’ mean anyway? Is it just being politically liberal? Does it have to do with technological progress? Is it about being ‘edgy?’ What made The Original Series (TOS) progressive? There isn’t a quick and easy answer to any of these questions, but they lie at the core of what TOS was and why it remains iconic today. These are also questions that have very different responses today than they did in the 1960s. And that is my argument in a nutshell. Science fiction is uniquely affected by the times. Unlike the timeless characters and themes of, for example, Shakespeare, science fiction is reliant upon a set of assumptions about the world. The writer assumes things about the world he experiences every day in order to craft a vision of a potential future. If those underlying assumptions change, or are just wrong, the message of science fiction loses effectiveness. A good example is the early fiction of Ken MacLeod and Peter F. Hamilton. Both of these authors released novels in the mid-90s that used the platform of communism as a vehicle to talk about the political challenges facing the world after the Soviet collapse. Both novels make compelling arguments for and against communism as a style of government. But they both feel dated when read today. While communist and socialist ideals may still exist, we have largely moved beyond irrationally vilifying an economic model. Similarly, some of Star Trek’s ideological message (and special effects) haven’t aged well. Just take the classic TOS episode, “Spock’s Brain” in which Spock has his brain removed by a female assailant but is somehow able to survive using a, wait for it, remote control headband. The premise is so absurd that even at the time it was considered to be one of the worst episodes of the series. On a more ideological note, the TOS episode “A Private Little War” parodied the U.S. and Soviet involvement in Vietnam and while the episode was a daring commentary at the time, today it feels more like history than a look into the future. Now don’t get me wrong. My argument isn’t that TOS isn’t progressive, just that it was progressive in the context of the 1960s. It’s not that the ideals of TOS aren’t progressive anymore; it’s that the forefront of being progressive has changed. So when The Next Generation (TNG) tried to capitalize on the progressive success of TOS by featuring, among others, a blind, black helmsman and a female chief of security, it didn’t manage to resonate the same way that Nichelle Nichols’ Uhura or George Takei’s Sulu did. 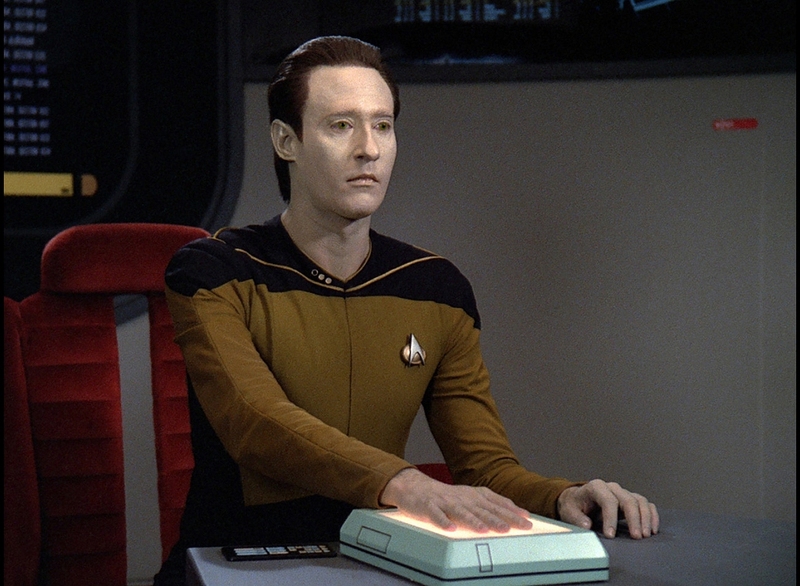 TNG’s failure to get back to the forefront of progressivism didn’t make for a bad show. America at the end of the 80s was in the process of a massive conservative shift that would define the next decade and set up many of the political conflicts we’re living through today. That TNG was able to hold its ground and make some small gains with stories like “Symbiosis” and “The Measure of a Man” is testament to a desire to remain progressive and influential, but the show has few real landmark moments. Really, Trek wouldn’t be a progressive leader again until the premier of Deep Space Nine (DS9) in 1993. With its sharp criticisms of war, terrorism and the military and a recommitment to the ideals of multiculturalism, DS9 moved beyond the legacy of TOS and claimed a new place for itself. The show’s timely indictments of the Gulf War, unchecked capitalism and the ethics of conflicts were not only important at the time, but oddly prescient of the wars in Afghanistan and Iraq. But the progressivism of DS9 is very different from that of TOS. While both shows depict a world where race is largely no longer a factor, DS9 was much more focused on political issues rather than social ones. When it did choose to focus on social criticism, DS9 was less successful. Episodes like “Rules of Acquisition,” “Rejoined,” and “Profit and Lace” danced around the ideas of gender, but did so in terrible taste. Even episodes like the much praised two part “Past Tense” approached the subjects of discrimination and disenfranchisement from a political angle, arguing for the expansion of federal employment programs. There is one notable exception to this rule, “Far Beyond the Stars,” and it is singularly spectacular. Everyone should watch it at least once for its uncompromising depiction of the 1950s and the inspiring final message. The roundabout point I’m trying to make here is that the ‘legacy of progressivism’ isn’t so straightforward. Being progressive means different things at different times. 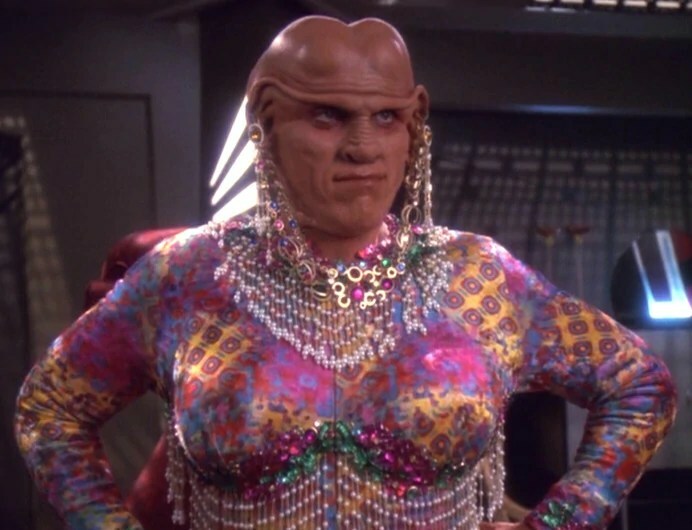 We criticize Trek, past and present, for not featuring strong LGBT characters because the LGBT movement is very visible right now and it seems natural to us that Star Trek should be commenting on that. But that’s on us. We’ve assigned a pseudo-obligation to be progressive to a franchise that was at its best when it could approach progressivism in its own way. Is it unfair to expect better of Star Trek? Probably. The creative staff of Star Trek have had their hands tied by studios, producers and lawyers at every turn. Were they capable of doing better? Of course, but there is a difference between what they were able to do and what they were allowed to do. TNG was supposed to feature an episode titled “Blood and Fire” that contained an allegory for the AIDS epidemic as well as a gay couple. That episode later made its way into the fan-produced Star Trek: Phase II, but was blocked from being produced for TNG’s television run. An untitled episode of TOS that would have featured Uhura and McCoy getting stranded on a planet where black skinned people were dominant was rejected for being too risky. So, it’s not that these ideas didn’t exist, just that they never became public knowledge. At the same time, shows like Farscape were able to portray a diverse and vibrant universe, commenting on the ideas of racial purity, discrimination, sexism and religious persecution, while featuring characters that transcend the concepts of gender and gender identity on such a complete level they don’t even seem human any more. Doctor Who uses kid gloves when it approaches the ‘big issues’ because it is, in some ways, still a children’s show, but it too has featured an ethnically and sexually diverse cast, though it tends to rely a bit much on the damsel-in-distress for drama. And my crowning jewel of an example, Caprica, a show steeped in the rhetoric of the religious conflicts of our time, but still willing and brazen in its depiction of homosexuals, group marriages, and racial tension. How can we even begin to call Star Trek ‘progressive’ in the face of these potent examples of our ability to do better? Well, the answer to that trick question is that Star Trek wasn’t on cable. So what’s the alternative? The television medium and particularly broadcast television is still one of the most effective ways to communicate a message to the masses. In my discussion with Geek Outsider, I mentioned that TNG effectively passed the torch of an egalitarian future back to science fiction authors. Writer’s like Iain M. Banks, whose series of Culture novels depicts a version of humanity so advanced that they can change gender through willpower alone and no body-morph is too far outside their ability to engineer. In such a society, race and gender mean nothing because everything is mutable. But Banks doesn’t have an award winning TV show to preach his ideas. Other authors, such as Catherynne M. Valente and China Miéville, have created incredibly compelling stories of progressive characters, but as litte as paperbacks and e-books cost, television is still cheaper and easier to access. At the end of the day, the conclusion that we are forced to come to is that there is no satisfactory alternative. Trek may not be perfect, but its ubiquity and steps in the right directions make it the best thing we’ve got in many ways. Does that mean we should give up on JJ Abrams’ version of Star Trek? No, but there is something to be said for accepting this vision of Star Trek for what it is. And, no, I’m not saying what it is or isn’t. I haven’t seen Into Darkness yet and I haven’t made up my mind about new Trek. We’re all just going to have to keep watching, and see what moves us to speak up, or maybe even cheer.